A variety of insects prefer to nest indoors. The most common are cockroaches, spiders, bedbugs, fleas, termites and ants. The best way to combat these bugs from nesting in your home is to learn how to identify them and where they like to roost. Then apply the extermination techniques appropriate to your particular infestation. If you find a dead cockroach, others—alive—are likely not far away. German, brown-banded or Oriental cockroaches are common household pests. The most common is the German variety, which is 1/2 inch to 5/8 inch long and light brown. The brown-banded type are smaller at about 1/2 inch and also light brown, but with two darker brown bands on their backs. The darker brown Oriental cockroach is bigger than both at about 1 1/4 inch. All cockroaches nest in dark, hard-to-reach locations. Food storage areas, and warm, humid environments in a home, such as under kitchen sinks or near major appliances, attract cockroaches. The Oriental cockroach can often be found in decaying matter inside and outside. Bedbugs are flat, oval-shaped bugs. Because they are less than 1/4 inch long and a hard-to-spot light brown color, they are most easily spotted with a large magnifying glass and a flashlight in the evening. Bedbugs nest in the cracks of walls, unclean sheets or mattresses and carpeting. They turn red after a meal of blood. Fleas, under 1/4 inch long and dark brown in color, often lay their eggs on pets that then hatch to create a potential infestation. Carpeting or the crevices of furniture are other common flea nesting areas. Treating pets, carpeting and furniture is an essential part of eliminating an infestation. Termites and carpenter ants are similar, but they may be differentiated by the broader midsections and straight antennae of the termite. Termites, when winged, have four wings of equal size. Winged carpenter ants have two different lengths of wings. Both of these insects can be found in rotted wood inside or outside a home. 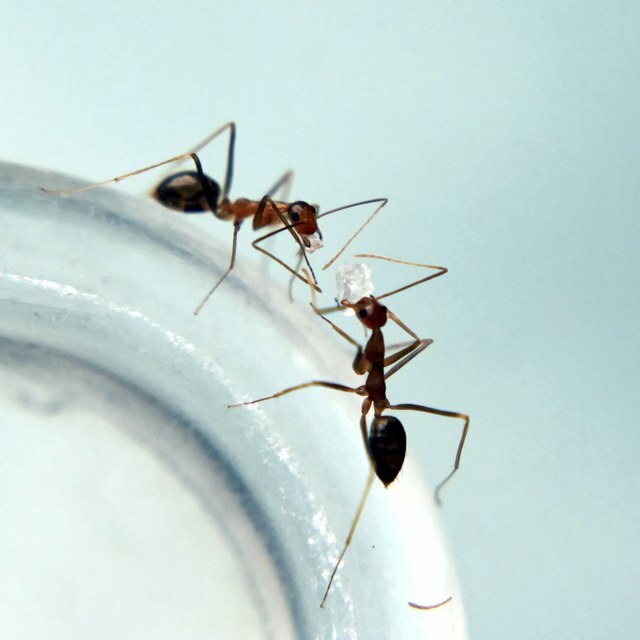 Other types of ants, usually smaller in size, form trails from outside the home to potential sources of food inside. Hundreds of species of spiders look for hiding places inside and outside of homes, mostly to catch other insects there. They often occupy cracks in ceiling beams or light fixtures, and sometimes in corners of ceilings. Silverfish are 1/2 inch to 3/4 inch in length and resemble flat centipedes with long antennae. They eat starchy foods, making the kitchen a likely place to find them. They also consume paper, so basements or storage spaces containing books and magazines attract them.